1/9/79 reports that Mr. Bennison [exact identity pending--presumably a staff member at Elan] advised Father Mark Connolly and Sheridan that Michael had admitted involvement after a long and arduous gruelling [WW] , but later recanted any involvement. We have numerous indications that Michael suffered from a serious alcohol and cocaine problem. Let us imagine for a moment, that after seeing Martha go off with Tommy, Michael went and did some coke--maybe in his room, maybe in the Revcon vehicle. Now, highly agitated, paranoid, and in a virtual state of psychosis, he puts on some dark clothing and decides to spy on them. At this point, the Terrien group has already left. So has Julie and Andrea. When Andrea [Julie] returns, it is Michael she sees in the bushes. When Michael does find Tommy and Martha, based on what Tommy has told us, he witnesses them in a very compromising position. But he waits. Maybe he flees in complete rage. Maybe this is when Andrea [Julie] sees him crouched. Maybe she sees him crouched before he stumbles upon Martha and Tommy. The point is, that Michael decided to wait and confront Martha alone. In Michael's mind, it is all her fault. She has humiliated him. Michael wants to confront Martha because he will be stringer [WW] than she is how [WW] [^] will be able to control the situation if he confronts her. 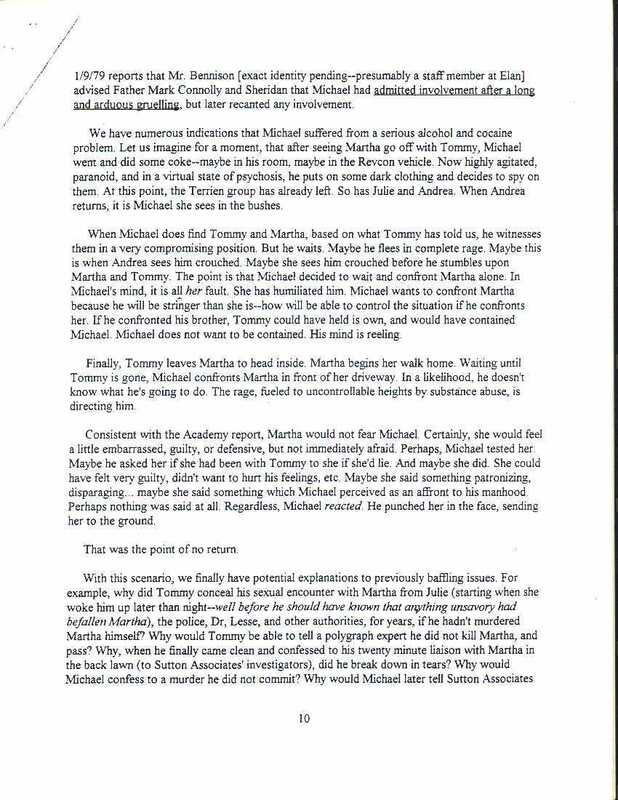 If he confronted his brother, Tommy could have held is own and would have contained Michael. Michael does not want to be contained. His mind is reeling. Finally, Tommy leaves Martha to head inside. Martha begins her walk home. Waiting until Tommy is gone, Michael confronts Martha in front of her driveway. In a [WW] likelihood, he know doesn't what he's going to do. The rage, fueled to uncontrollable heights by substance abuse, is directing him. Consistent with the Academy report, Martha would not fear Michael. Certainly, she would feel a little embarrassed, guilty, or defensive, but not immediately afraid. Perhaps, Michael tested her. Maybe he asked her if she had been with Tommy to she if she'd lie. And maybe she did. She could have felt very guilty, didn't want to hurt his feelings, etc. maybe she said something patronizing, disparaging... maybe she said something which Michael perceived as an affront to his manhood. Perhaps nothing was said at all. Regardless, Michael reacted. He punched her in the face, sending her to the ground. That was the point of no return.